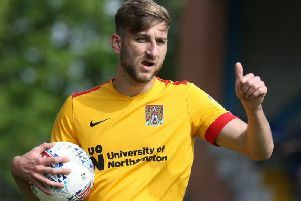 Boss Keith Curle believes Ash Taylor is the ‘dominant character’ needed at the heart of the Cobblers defence. The former Aberdeen man has been the brunt of plenty of criticism from sections of the Town supporters this season, with many perceiving the performance levels of the club’s reigning player of the year have not been up to scratch. Former Manchester City and England central defender Curle disagrees though, and feels the player is a victim of ‘expectancy’ after being a hit in his first season at Sixfields. He sees the 28-year-old as a lynchpin of his defence moving forward, and says he will never pick a team ‘based on popularity from supporters’. Taylor enjoyed a strong performance in Tuesday’s 2-1 win at Tranmere Rovers, and Curle said: “I think Ash is a dominant character, who was player of the year here last season. “What you then find is that the expectancy from supporters will be that they identify players that have done well. “Then when those players or the team hasn’t done as well, the focus is on the players that previously have been the focal point. “Sometimes it can be not down to their own individual performances, it can be down to the team’s results. “Luckily, I don’t pick a team based on popularity from supporters. “The system we are playing at the minute, we need a dominant, aerial header of the ball in the middle of our goal. “Crosses and balls come into the box in abundance and we need somebody who is willing, and whose one of their main attributes is dominance in the air, and Ash has that. Being able to ‘handle a football’ is a key factor for Curle, who believes in Taylor, Charlie Goode, Aaron Pierre and Jordan Turnbull he has a strong quartet of senior central defenders who are more than capable of handling what league two football can throw at them. “Ash can handle a football, as can Charlie Goode. He is dominant in the air, can handle a ball and has good mobility,” said Curle. “Look at Aaron Pierre, he is a dominant presence but needs to be more pleasing on the eye with the football. “That is something he is working on and we have identified areas that we can use Aaron’s ability to make the pitch available with his range of passing on a more consistent basis. “Jordan Turnbull can handle a football, is a decent size, and we are working on his dominance in the air, because I think for his size he can be more dominant. “But it shows we have a platform that can handle league two, that can handle the aerial bombardment that you do get, but I would like them all to be more of a threat in the opposition’s box.